All started up early 2009 when my colleague Gerhard Lausser, our local Nagios guru, came up in my office and complained heavily about how damned hard it is to monitor Java EE servers with Nagios. As you might know, Nagios uses a plethora of plugins for doing the hard monitoring stuff. These are running locally on a central Nagios host contacting the watched systems mostly remotely with various techniques. For Java applications, JMX is of course the proper choice which provides JSR-160 connectors remote access to the local MBeans. At this time, indeed several JMX Nagios plugins were already present. However, they all suffer from the same problem: JSR-160 connectors are highly Java centric where its default protocol RMI is not available outside the Java universe. So, each plugin (which runs in an external process when called by Nagios) needs to start up a Java Virtual Machine. This has to be done for every check, and since there are usual hundreds of checks every five minutes this becomes easily a performance and memory bottleneck. Additionally, you need a Java installation on the Nagios host, which for many administrators poses a, let's say 'cultural' problem. As a Java programmer I love JMX. It is one of the oldest Java specifications, which was carefully crafted from the very beginning (especially the core API). Other Java APIs had to take a longer tour until they became widely accepted by the masses as not being painful (think "EJB" or "JSF"). However, I'm not really happy with JSR-160's focus on Java based remote protocols. There has been some efforts to make these more friendly to the outside world (e.g. a JSR-160 WebService connector as defined in JSR-262), but it seems there is not much momentum anymore behind these. In fact, the last update on JSR-262 was in May 2008 and it is marked as "inactive". And frankly, I don't want to use WebServices for monitoring, either (although WS-Mangament is an interesting approach). That was the birth of jmx4perl in May 2009. Coming from a strong Perl background (being a SGI system administrator at university in my former life), my initial goal was to use pure Perl for accessing remote JMX information without the need of a local Java integration. In turned out that an agent based approach was the simplest way. The first agent, a Java EE webapplication, which on the frontside translates HTTP requests with a JSON payload to local JMX calls (and vice versa for the response), was really lightweight. It knew how to read and set attributes and how to execute operations. It had a list mode for looking up all registered MBeans. And it was 38kb in size. The jmx4perl agent is now ~ 200kb 'large' with many more features (search, bulk requests, security, ....) but I still call it lighweight ;-). The perl part consists now of a powerful Nagios plugin called check_jmx4perl, a command line tool called jmx4perl, a Perl library named JMX::Jmx4Perl and a readline based (with context sensitive tab completion on MBean names) JMX shell called j4psh. From the feedback I got, it seems that the Nagios world is happy now. But since I think that this agent based approach provides also a good alternative to JSR-160 connectors for other platforms, it is time to move on and split the Java and Perl part of jmx4perl into two separate projects. The number of programmers who love both Java and Perl is negligible anyway ;-). The Perl part (which is approximately the same size as the Java part) remains jmx4perl, the agent part has become ... Jolokia. Why it is named "Jolokia" ? 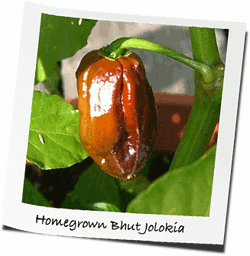 Jolokia is one of the world hottest chili pepper with a Scoville rating of at most 1,075,000. I'm a chili head and grow chilis since 2006. I love chilis as much as JMX. That's the main reason. My name is Roland Huss and during the last decades, I mainly acted as Java wizard, transforming large XML documents into huge stacktraces. Gerhard Lausser for pushing me hard to come up with jmx4perl and a way to allow JMX usage from a Java hostile environment. My former employer ConSol* for supporting the development of Jolokia. Allez (and especially Sorin Anca) for the artwork and this very fine logo. Stephan Beal for ironing out my dump english and proofreading the documentation. Now for the obligatory legal stuff. I keep it short, only the common boilerplate.